When you combine our skilled craftsmanship and reliable service with our durable, scientifically-tested materials, the end result is 100% customer satisfaction. A finished basement will not only give you and your family an extra room to enjoy together, it will also add to the resale value of your Tennessee home. Our total basement finishing package is reserved for Tennessee homeowner’s who want or need to completely remodel their basement, including its floors, walls, ceiling, windows, and insulation. If you’d like to just focus on one or two areas of your basement, however, we can help with that too! Whatever your needs, our Tennessee basement contractors have the knowledge, training, and experienced necessary for any task. Whether you live in Memphis, Chattanooga, Knoxville, Nashville, or Davidson, our Tennessee basement remodeling contractors are standing by, waiting for your call. 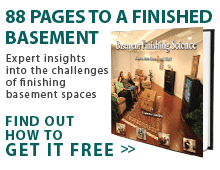 Contact us today to schedule your free basement finishing consultation and receive a free estimate. The sooner you call, the faster you’ll be able to relax in and enjoy your newly remodeled basement! Full unfinished basement and we want to convert part of it to an exercise and game room. I want to get an estimate on putting your hardwood floors in my basement. Comment: Full unfinished basement and we want to convert part of it to an exercise and game room. Comment: I want to get an estimate on putting your hardwood floors in my basement.